This is the ultimate TrueStrike - it is aimed primarily at golf professionals and driving ranges but if you have the space it s also fantastic for home golfers too. Both left and right handed golfers can enjoy the full TrueStrike experience without any configuration changes required. Every golfer from amateur to expert can benefit from practicing with the TrueStrike MKVI Double. If you have any questions regarding the TrueStrike Double Golf Mat, please give us a call, we would be happy to help you with any questions you may have. 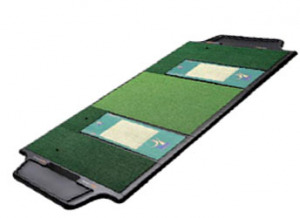 Write an online review on the TrueStrike Double Golf Mat, and share your thoughts with others.